Sharks, skates, and rays can detect very weak electric fields produced by prey and other animals using an array of unusual organs known as the ampullae of Lorenzini. Exactly how these electrosensory organs work has remained a mystery, but a new study has revealed an important clue that may have implications for other fields of research. 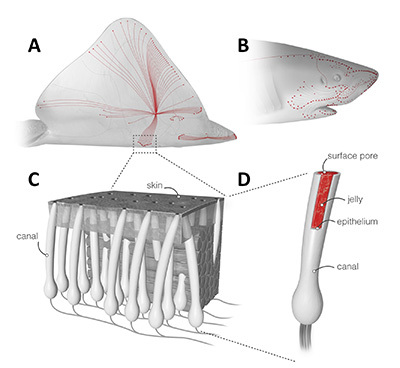 First described by Stefano Lorenzini in 1678, the ampullae of Lorenzini are visible as small pores in the skin around the head and on the underside of sharks, skates, and rays (known as elasmobranchs, a subclass of cartilaginous fish). Each pore is open to the environment and is connected to a set of electrosensory cells by a long canal filled with a clear, viscous jelly. In the new study, published May 13 in Science Advances, a team of researchers from UC Santa Cruz, University of Washington, and the Benaroya Research Institute at Virginia Mason investigated the properties of this jelly. They found that the jelly is a remarkable proton-conducting material, with the highest proton conductivity ever reported for a biological material. Its conductivity is only 40 times lower than the current state-of-the-art proton-conducting polymer (Nafion), said corresponding author Marco Rolandi, associate professor of electrical engineering at UC Santa Cruz. "The observation of high proton conductivity in the jelly is very exciting," Rolandi said. "We hope that our findings may contribute to future studies of the electrosensing function of the ampullae of Lorenzini and of the organ overall, which is itself rather exceptional." The integration of signals from several ampullae allows sharks, skates, and rays to detect changes in the electric field as small as 5 nanovolts per centimeter. But how such weak signals are transmitted from the pore to the sensory cells has long been a matter of debate. The researchers speculate that sulfated polyglycans in the jelly may contribute to its high proton conductivity. Proton conductivity is the ability of a material or solution to conduct protons (positive hydrogen ions). In a system with very many ordered hydrogen bonds, such as a hydrated hydrophilic polymer, proton conduction can occur along chains of these bonds, Rolandi explained. In technological applications, proton conductors such as Nafion can be used as proton exchange membranes in fuel cells. "The first time I measured the proton conductivity of the jelly, I was really surprised," said first author Erik Josberger, an electrical engineering doctoral student in Rolandi's group at UW. "I didn't expect a natural material to approach the proton conductivity of an engineered material like Nafion." The new findings may be of interest to researchers in materials science and other fields. Applications of the discovery could include unconventional sensor technology, Rolandi said. In addition to Rolandi and Josberger, the coathors of the paper include Pegah Hassanzadeh, and Yingxin Deng, doctoral students in the Rolandi group at the University of Washington; Joel Sohn at UC Santa Cruz; and Michael Rego and Chris Amemiya of the Benaroya Research Institute in Seattle. This research was funded by the National Science Foundation, the Office of Naval Research, and the National Institutes of Health.